Once promoted as a shining example of the compatibility of Islam and democracy in the post-Arab Spring world, Turkey has instead become a case study in authoritarian transition. Due to an increasing monopolization of power, Turkey’s democratic institutions have been under attack, especially since the 2013 Gezi Protests. Erdoğan’s arbitrarily-exercised emergency powers after the enigmatic 2016 coup attempt may have been decisive in placing the country on the path to authoritarianism. Yet, against all odds, democratic resistance in Turkey has not faded away. Youth groups, environmental activists, journalists, academics, Kurds, and women persistently seek to overcome Erdoğan’s moves towards a one-man regime. While hundreds of academics are on trial for their signature on the Academics for Peace Petition, they continue to speak truth to power in volumes of court defenses. As tumultuous times for Turkey’s democracy continue, along with post-Arab Spring counter-revolutionary repression, can theories of “Islamic democracy” or post-Islamism still be sustained? Can a democratic project for Muslim-majority countries from within Islam still be defended, either in theory or as a viable political option? Or, do the new realities on the ground signify their demise, urging the articulation of alternative conceptions for sustainable democracies in the region? 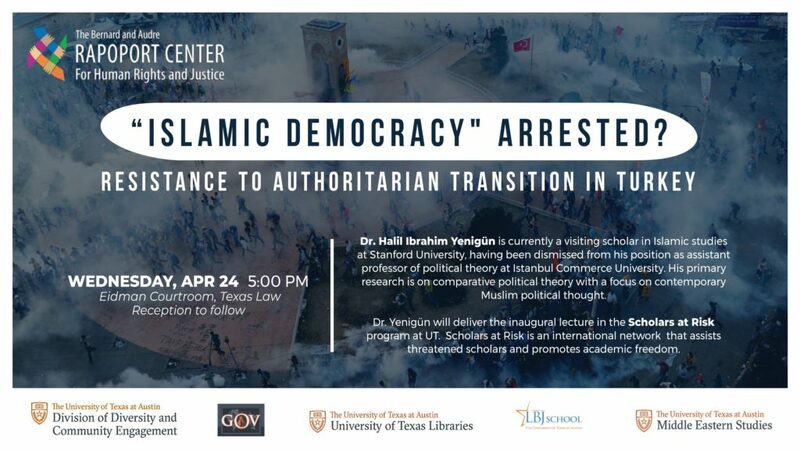 Dr. Halil Ibrahim Yenigün is currently a visiting scholar in Islamic studies at Stanford University, having been dismissed from his position as assistant professor of political theory at Istanbul Commerce University soon after Erdoğan’s regime began the purge and persecution of academics who signed the Academics for Peace petition. He researches and publishes on comparative political theory, with a focus on contemporary Muslim political thought. Dr. Yenigün joins us on campus as a part of the Scholars at Risk program. Scholars at Risk is an international network to which UT belongs that assists threatened scholars and promotes academic freedom. More information about the Scholars at Risk program is available here. A reception in the Sheffield-Massey Room will follow the lecture. The Division of Diversity and Community Engagement, the Joe R. Long Endowed Chair in Democratic Studies in the Department of Government, the Lloyd M. Bentsen Jr. Chair in Government/Business Relations at the LBJ School of Public Affairs, UT Libraries, the Center for Middle Eastern Studies, and the Scholars at Risk Network.